This new release from EMI Classics for Pleasure is comprises three works written for children. The first, Alan Rawsthorne’s Practical Cats, was composed in 1954 at the suggestion of the Edinburgh Festival as an “entertainment” for children, while both Prokofiev’s much loved Peter and the Wolf and Britten’s Young Person’s Guide to the Orchestra were composed specifically to educate children about the instruments in the orchestra. This compilation of old EMI tapes opens with the 1957 recording of Rawsthorne’s Practical Cats, which has long been a great favourite of mine, given its stunning combination of excellent orchestral playing and a peerless narration from Robert Donat. With its scintillating and witty playing the Philharmonia, conducted by the composer, captures the alternating playfulness and mystery of these utterly delightful movements very well indeed. Donat’s distinctive and restrained manner, deliberate yet softly-spoken enunciation, clarity of diction and gorgeously old-fashioned narrative style exudes charm, dignity and nostalgic refinement. He is beautifully characterful and relays T. S. Eliot’s brilliant poems with a touchingly tender affection. It is a deeply moving version – the nobility Donat gives to Bustopher Jones or the poignancy to Old Deuteronomy is absolutely guaranteed to bring tears to the eyes of anyone who holds an affection for old England. Unsurpassable … not that I am aware of any other versions available at the moment. 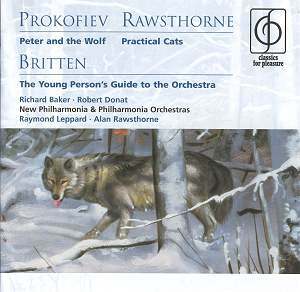 The 1971 recordings of Prokofiev’s Peter and the Wolf and Britten’s Young Person’s Guide to the Orchestra are narrated by Richard Baker. Although the Britten is very good, with excellent orchestral playing and Baker on good form - pleasingly instructive and interesting without being condescending - I was slightly less impressed by the Prokofiev, a version I have not listened to since about the age of 8! The New Philharmonia needs a bit more life and spark, as I felt the performances a little lacking in excitement. The whole wolf, episode, for example, can be really sinister and frightening – but not so here. Baker, similarly, is far too “safe” in his narration – with no particularly special voices or characterisations. There are numerous other versions of both of these works. On Cala we find both works along with the Sorcerer’s Apprentice, with Ben Kingsley as narrator, and the London Symphony Orchestra conducted by Sir Charles Mackerras (a 1995 recording). Although Kingsley’s voice is at the same time more gentle and far more expressive than Baker’s, he seems to put rather strange emphases on the words … or emphasis on strange words, perhaps! Although his Grandfather is wonderfully growly - as he should be! - the bird sounds almost exactly like Wallace from Wallace and Gromit – rather off-putting! The strange weightings and stresses on words continue into the Young Person’s Guide to the Orchestra, and Baker’s version is by far preferable to Kingsley's – not least on account of the due reverence and respect with which Baker endues the words (speaking of Purcell) “great English composer”! The best Peter and the Wolf I can find is that with good old Michael Flanders on HMV Classics - Efrem Kurtz conducts the Philharmonia Orchestra in 1959. Flanders is perfect – getting the combination of both interest and clarity along with fantastic characterisations, combining the best aspects of both Baker and Kingsley without any of their faults. The animals are superb - duck especially, with its little extra quack! – brilliantly done, yet without sounding actually silly. The Grandfather doesn’t sound gruff enough - my one bone of contention. In my mind’s ear, he should be a deep, low, gruff and grumpy grandfather. That said, he is still very characterful, ancient and worried-sounding. This disc also contains a perfectly decent performance of the Britten with Groves conducting the Royal Liverpool Philharmonic Orchestra but without a narrator. Another good but unfortunately narrator-less version can be found on EMI Classics with Rattle and the City of Birmingham Symphony Orchestra in 1996. Although I am slightly hesitant about the Prokofiev on this disc, the Britten is excellent and the Rawsthorne outstanding. If you have children, buy this for them! If you don’t, buy it for yourself. It is worth it for the Rawsthorne alone!